What did David West mean? Following the Warriors’ sweep of the Cleveland Cavaliers, the power forward hinted that Golden State struggled with internal issues during the season. “When you guys find out about that s—, you’ll trip,” he said. Weeks later, the two-time NBA All-Star retired after an impressive 15-year career that ended with two straight titles and no explanation of those words. As training camp arrived for his former team on Monday, the 38-year-old finally explained what he meant. “There’s stuff with every team that stays off the radar,” West told The Undefeated in a phone interview from Raleigh, North Carolina. “And that was my point. Like, we’re no different. But all you heard was like, ‘Well, how easy was this year?’ And, ‘what does it feel like not having had to deal with, basically?’ That wasn’t the year that we had. And that’s all that was. “We experienced different things throughout the year that every other team goes through. Emotions, ups and downs, highs and the lows. You go through the wear and tear, the drag of the season just like everybody else. Just because you’re the top team, or you’re a team that’s outperforming people, doesn’t mean you’re immune from those things. And he believes the Warriors’ quest for a third straight title will be their biggest challenge yet. Are the Warriors so good they won’t be fun to watch next season? “It’ll be the toughest year they have,” West said. “It’s going to be health. The hard thing about sort of being in the position that the Warriors are in, everybody gets to adjust to you. Everybody gets to sort of gear up and figure out ways to beat you. The Warriors still have a roster full of stars, but both Warriors coach Steve Kerr and general manager Bob Myers said West will be missed as a mentor for the younger players and a veteran voice in their locker room. The following is more from my conversation with West, who plans to be in Oakland, California, to receive his championship ring when the Warriors host the Oklahoma City Thunder on opening night. We discussed what’s next for him on and off the court, what caused him to retire, inspirational words from Jerry West, Manu Ginobili and Jamal Mashburn, and what’s on his socially conscious mind. Is this a weird time for you being retired with NBA training camp arriving? Man, it’s just life. I’ve always had other things going on, so those things just sort of become more centrally focused. I knew it was time. I felt it, and there was really nothing more I could do. I gave myself as much time as I could to sort of hit that feeling. So no, it’s not weird. What was the tipping point that led to retirement? I just didn’t have the desire to prepare. And for me, I’m a weight room guy. I’m a guy that prides myself on just work, work, work, work, work. The idea of me having to go to the gym four times a week this summer, get myself right, it just wasn’t there. And then again, it just gets to a point where I feel like I’m not a gambler. I feel like there would be a greater risk for me to continue to play than the reward. Over the last few years it’s just gotten harder and harder and harder. One of the reasons in an environment, particularly like the Warriors, is because it didn’t make the preparation as hard, didn’t make the journey as hard. 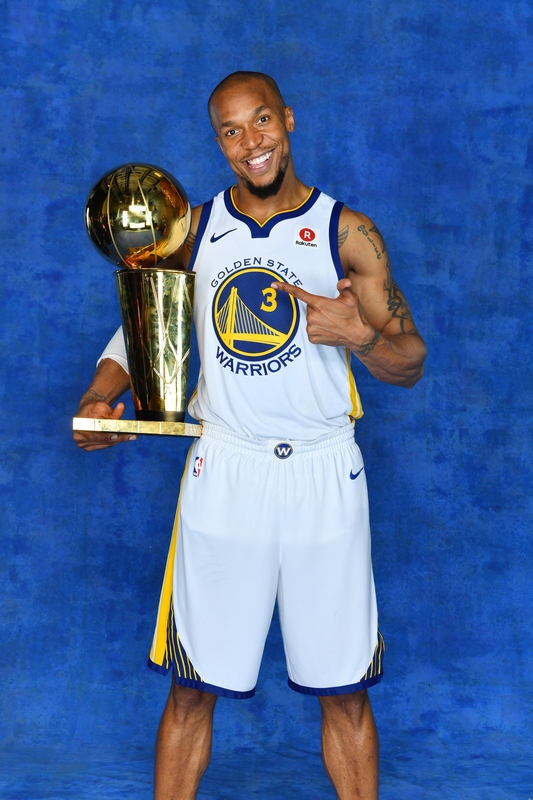 David West of the Golden State Warriors poses for a portrait with the Larry O’Brien Championship Trophy after defeating the Cleveland Cavaliers in Game 4 of the 2018 NBA Finals on June 8 at Quicken Loans Arena in Cleveland. Was it more your body or your mind that led to retirement? I’m a thinker, and so at the end of the day, this is just a game. I always have struggled with making more out of this game than there actually is to it. I had to, at times, create mechanisms to psyche myself out about that. And I know that’s not something that other guys go through because they may not be the type of thinker that I am. Have you been offered any basketball jobs since retiring? I was offered a few jobs, man. I’m like, ‘Thanks, but no thanks right now.’ I just got to take some time to evaluate things. I want to get off of that NBA schedule, at least for a year, give myself a chance to spend some time with my family, coach a full AAU season. I know it sounds crazy, but that’s what I like to do. That’s what feeds me, so just being able to do stuff I haven’t been able to do. Spend Thanksgiving with my family back here East. I have been offered jobs to coach at both levels, college and pro. That’s not something that I wanted to just jump right into. I don’t have to be consumed with making money every moment of my life. Guys get caught up in that, and the world is bigger than sort of what we’ve been made to believe. And I’m fully aware of that, so I’m not going to. I had a great conversation with Mash [former NBA player Jamal Mashburn] this summer, and it really was that conversation that ultimately kind of got me to realize what I had to do, because Mash has done some great things beyond basketball. Some of the things that he said made things pretty clear. And I’d already been kind of leaning that way. But, just knowing how I am, it would have been ungenuine and non-David West-like to keep playing. There’s life, there’s a world outside of this sort of world that we’re so accustomed to. A lot of it has to do with comfort, you know what I’m saying? I’m just not one of them people, man. I’m not afraid of the world. I’m not afraid to be a rookie again in some other field, you know what I mean? I remember when I was in San Antonio, I had a conversation with Manu about that, and he was like, ‘Oh, you realize, like, when you retire, you could be 40 and you could work another 25 years in another job till you’re 65?’ So you got to have that kind of perspective, and I think if you don’t, retirement can be difficult. Can you talk about your role with Zoetic? I may lecture some. I’m currently writing, so a combination of doing lecturing and writing, working with Zoetic, that’s sort of what I do away from basketball. What’s mostly on your mind, socially, right now? We’re in a continued struggle for peace and justice, period. Everybody’s got different roles to play. What has happened to us [African-Americans] over the course of these last 500 or so years has been a total destruction of what we knew. If you go through any period of history in the last 500 years, everything about us is about restoration, is about recovery, is about us restoring ourselves or getting back to the playing field of humanity. So that doesn’t ever change. One of the issues that I have is that we jump from hot topic to hot topic. But the underlying issue never changes, the desire for a system of justice and a world that is governed by peace. That should be the desire of all men. I’ve had a few folks try to pull me into politics, and I’m not going to do politics either. Because, again, it’s just not something that I feel convicted about. But the idea is that we’ve got to sort of change our orientation as a society. I’m always focused on peace and justice. Everybody’s on the Colin Kaepernick train, but nobody understands what the message is. Kap’s message is a message of peace, is a message of justice. We want a system that’s just for all people, and we want people to be governed in their realities, their social orientation to be governed by peace. And that’s what the world wants. We’re going to get there one way or the other, because this country is coming to a point where it’s going to have to face what it is as opposed to what it’s always tried to project itself as. We’re going to have to face what we are, what we’ve always been. In order to give our kids, to give the young people in this country, a chance, we’re going to have to change fundamentally. And anybody talking anything short of that is just missing the mark. How do you reflect on your NBA career? I never took what I did too serious in terms of measuring it against actually what it means in the world. It was a hell of a ride. I overachieved, in my mind, because I was overlooked in high school, and overlooked coming out of college, and outlasted a lot of people that were supposed to be better than me and did better, to be honest with you, better than I ever thought I would. So, when I look back on it, I’m very fortunate in that. I’m very proud of that, very thankful to have sort of gone through what I went through, the steps that I had to take, and I wouldn’t change anything. When you retired, did you receive a message that you will never forget? I had a pretty long text conversation with Jerry West. There were a lot of things he shared with me just about how he’s followed me over the course of my career that I didn’t know. From somebody like that to have the kind of, he knew some pretty intricate details about some things about me. And he said he wanted to share those with me once I retired. That was pretty good. And then just having conversations with old coaches and getting messages from people you didn’t know were fans of yours or admirers of yours. That was probably the highlight of it. What words of wisdom would you give your old teammates? I would just say depend on that experience. Depend on what got you to that point. And lean on what you’ve done in the past in terms of knowing what it takes to win. When it’s time to hit that switch, be healthy enough to hit that switch.